Looking for some fun reasons to celebrate with your family during May? Then you’ll love these celebration ideas for some May Bizarre Holidays for family fun. May 1st – Mother Goose Day: A great day to enjoy some classic Mother Goose stories with your kids or have a Mother Goose charades party! May 3rd – Paranormal Day: You can celebrate this day with your kids by making some fun alien pancakes for breakfast or watching a kid-friendly alien movie while enjoying some green popcorn. 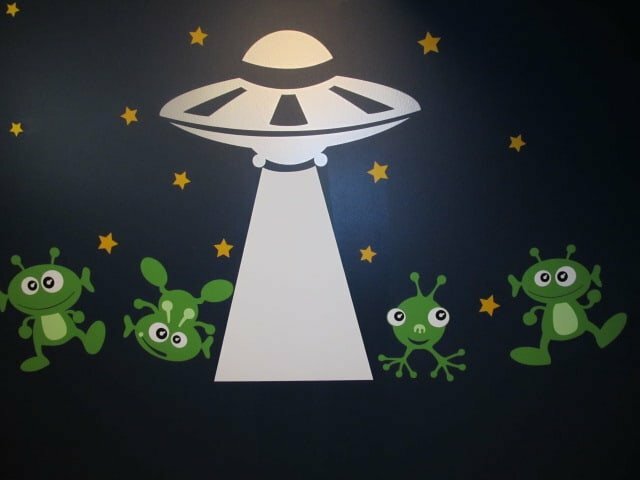 Let the kids stick glow in the dark stars on the walls for this special movie night. May 4th – Star Wars Day: Have a little Jedi in your family that would love some Star Wars themed fun? Then try this Jedi training obstacle course idea! Looking for something a bit more relaxed, then check out this free printable Star Wars word search. May 5th – National Scrapbooking Day: What a great day for some craft fun! Provide your children with plenty of scrapbooking paper, stickers and other embellishments and let them create a scrapbook page for a fun event that they attended or a favorite vacation photo. May 5th – Cinco de Mayo: This really isn’t one of the May Bizarre Holidays for family fun but it is a fun holiday that happens to be in May! There are so many fun ways to celebrate this special holiday – check out some fun ideas here or this free printable Cinco de Mayo word search. May 6th – World Laughter Day: Host a fun family movie night filled with kid-friendly comedies and a movie concession stand with fun kids movie trivia. May 12th – National Babysitters Day: This is a great way to teach your children some fun ways to be kind. Provide some scrapbook craft supplies and have then make a homemade card for the babysitter. May 12th – National Miniature Golf Day: Gather the family together for a fun afternoon of mini golf. You could create some fun awards to hand out after your non-competitive game. Any May Bizarre Holidays for family fun that involve trophies must be fun, right?! May 12th – National Nutty Fudge Day: Your children can help out in the kitchen while making this delicious fudge – maybe even package some up to go along with your National Babysitters Day card! May 12th – National Train Day: Dig out all the toy train & track sets for some family fun. If you have a train museum in your city, today would be a great day to take a trip there. May 18th – International Museum Day: This is a great day to take a trip to your local museum and play this fun free printable museum scavenger hunt. May 18th – National Pizza Party Day: You’re sure to be hungry after your day playing the scavenger hunt at the museum so on your way home why not make a stop at a pizzeria to celebrate National Pizza Party Day. May 18th – Visit Your Relatives Day: Pack up the family and make a short road trip to visit some relatives for the day. Looking for something fun to do in the car? Check out this free printable road trip scavenger hunt or free printable road trip bingo. May 24th – International Tiara Day: What little girl (or even mom!) wouldn’t want to be a princess for the day? Celebrate International Tiara Day with a princess tea party, princess movies and princess coloring or crafts – all while wearing a tiara of course! May 25th – Geek Pride Day: Are you a geek? It’s okay, you can admit it (we all have a geek side)! If so, then this day is for you! Embrace your geek-side today by celebrating who you are and what you enjoy! May 28th – Memorial Day: Celebrate with some Memorial Day activities with the kids or this free printable Memorial Day word search. Do you know of any other May Bizarre Holidays for family fun? Which of these May Bizarre Holidays for family fun do you look forward to celebrating with your family? Stay updated on all the silly and fun ideas by following us on Facebook, Twitter, Pinterest and Bloglovin’. *Visit Brownielocks & The 3 Bears for a full list of special holidays (and other May Bizarre Holidays for family fun) that you can celebrate with your family! She has the most complete list of holidays that I’ve seen. I love celebrating unusual holidays ~ actually, I love celebrating any holiday! Life can sometimes be so stressful that taking even five minutes to think about the usual “holidays”, keeps a smile on my face! Wow! What a fun list! I think my kids would like Pizza Party Day. I might have to talk them into Museum Day. I will have my tiara ready to go! Thanks for stopping by! I hope you have fun celebrating! One, your blog is adorable! Two, I never knew there could be so many holidays in one month. Is every month like this? I know my boys will get on board with celebrating Star Wars day! Thanks for stopping by! Yes, there are so many fun (and some bizarre) holidays to celebrate. I’m always open to a new reason to celebrate – especially the holidays that involve chocolate. Brownielocks has a long list of holidays for each month – it’s a fun read! Thanks again for stopping by!